1. Data Dependencies: when statements compute data that are used by other statements. 2. Control Dependencies: are those which arise from the ordered flow of control in a program. 1. Flow Dependence: Sj is flow-dependent on Si if a value of a variable used by Sj was computed by Si. 2. Antidependence: Sj is antidependent on Si if a value of a variable used by Si is recomputed by Sj. 4. 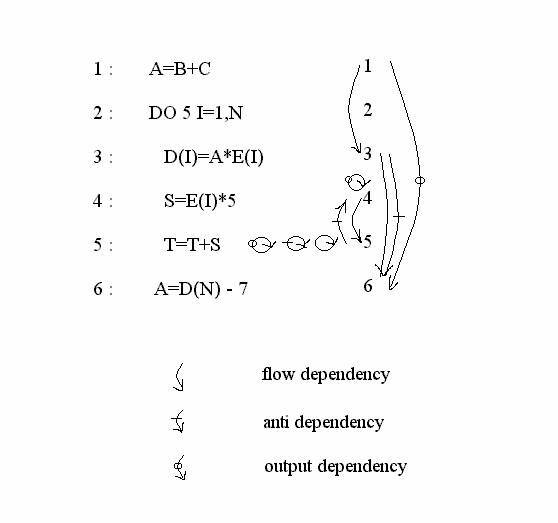 Control-Dependence: Sj is control-dependent on a conditional statement Si if its execution of Si and the path chosen after that( Si must execute before Sj). Figure 2 shows a FORTRAN program code and dependency analysis based on that program segment. Variable A in statements 1 and 3 is an example of flow dependence in which a variable is defined in one statement and used in a subsequent statement. Anti Dependence is mirror image of flow dependence, it occurs when a variable is used in an earlier statement and then reassigned in a subsequent statement. An example is variable A in statement 3 and 6 of figure 2. Output dependence occurs when a variable is assigned more than once in different statements as in statement 1 and 6 of figure 2. The basic idea behind dependency graphs is for compiler to look for various kinds if dependence among statements to prevent their execution in wrong order i.e. the order that changes the meaning of the program. This helps it to identify various parallelisable components in the program.